Do you feel like you are reaching your full potential at work (and away from it)? You aren't alone! A staggering 70% of American workers feel disengaged in the workplace, according to a 2016 Gallup Poll. These roadblocks lead to negative company culture, the "revolving employee door" and a life lived without passion and meaning. Most surprising? We actually know WHAT to do and HOW to do it…but we DON'T DO IT! It is FAILURE TO IMPLEMENT. Our Failure to Implement the proven processes and powerful tools that we know will lead to positive change and greater fulfillment, is the #1 cause of human disengagement - at work and away from it. Are you ready to solve it? The BREAK THRU seminar is a dynamic, interactive day-long workshop that will challenge your thinking and help you re-imagine how you and your co-workers engage in the workplace! 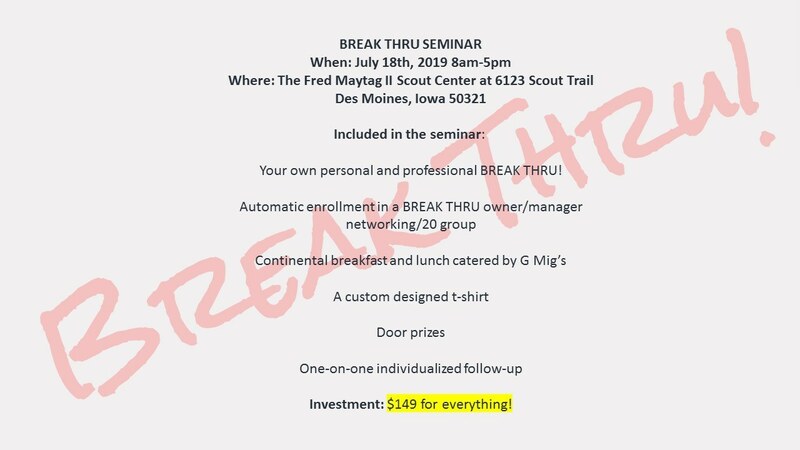 The BREAK THRU seminar will provide you with powerful tools and real-world strategies, along with the motivation and the WILL to use them, to eliminate Failure To Implement and produce PROFOUND RESULTS, at work and beyond! "By far, one of the more refreshing clinics I've ever attended! Jonnie will inspire you to run your business and conduct your life in a way that sets you and your company apart from the rest." "Great engagement of audience and several powerful truths about people and business. Left me moved to change for the better." Join Jonnie and Lorri Wright, a lively and inspiring husband and wife team who have grown their business from the ground up by BREAKING THRU their own failure to implement. Jonnie and Lorri will take you on a journey to discover your WHY, and to get to the root cause of your own failure to implement. They will teach you strategies to BREAK THRU your own personal and professional barriers! Jonnie and Lorri are successful facilitators who provide interactive, thought-provoking, and valuable experiences to all who attend their seminars. Business owners, managers and employees from all business categories will greatly benefit from this full day hands-on interactive event that combines large group training, small group discussions, and breakout sessions!